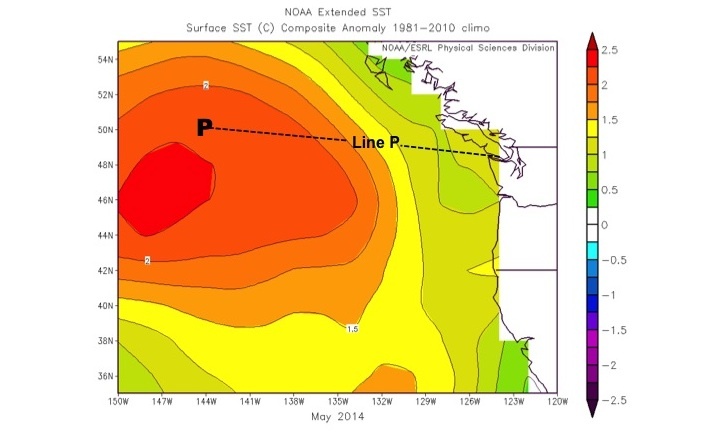 Researchers at PMEL and JISAO are monitoring an area of warm surface water that has been occupying the Northeast Pacific near Ocean Climate Station Papa buoy. This mass of water, nicknamed “The Blob”, was about 3 degrees Celsius warmer than normal in February and is maintaining its abnormal heat into the summer. The warm water has implications for the marine ecosystem and could affect the weather in the Pacific Northwest. Past summers with especially warm water off the coast have tended to be warmer and more humid than usual. To check out the latest conditions with The Blob, visit the Ocean Climate Station Papa buoy page.